Four Russian military advisers have been killed and three others have been injured in the Syrian province of Deir Ezzor in a shelling carried out by militants, the Russian Defense Ministry said in a statement on May 27. According to the statement, militants attacked an artillery battery of pro-government forces assisted by Russian military advisers. Two Russians were killed on the scene. Two others died from wounds in hospital. 43 ISIS members were killed and 6 vehicles belonging to the terrorist group were destroyed during the clashes. The Russian Defense Ministry provided no details on the location and date of the incident. It should be noted that on May 23 ISIS attacked a group of pro-government forces near the city of al-Mayadin. After the attack, the ISIS-linked news agency Amaq claimed that ISIS members had killed 23 “Syrian and Russian” troops and captured 5 others. However, Amaq provided no evidence to confirm any captured or killed servicemen of pro-government forces. Pro-opposition media used the May 27 statement by the Russian military to spread own speculations. According to the Syrian Observatory for Human Rights, at least 26 members of government troops and 9 Russians were killed last week in eastern Syria. The Russian opposition media added that at least two Russian private military contractors were killed in the May 23 clashes with ISIS. No photo or video evidence or official sources for the claims were provided. A Russian fifth-generation Su-57 stealth fighter jet carried out strikes on militant targets in Syria in February 2018, Russian Defense Minister Sergey Shoigu announced on May 25. According to Shoigu, the Su-57 fighter jet used advanced air-launched cruise missiles to target militants. Two Su-57 fighter jets were temporarily deployed in Syria in February 2018 where they successfully passed combat tests. Israel has notified Russia of its decision to redraw its Iran “red lines” and to expand its operations across Syria, the Saudi newspaper Asharq Al-Awsat reported on May 26. According to the report, Israel is going to expand its operations to the entirety of its northern neighbor’s territory rather than just the southern portion of Syria. The report came just a few days after another round of Israeli strikes on Syria. On May 24, the al-Dabaa airbase in southwestern Homs came under a missile attack. According to Sky News, at least 9 Iranians were killed in the strike. The Iranian state-run media denies this. Local sources also reported no casualties in the attack. According to Syrian experts, the May 26 report by Asharq Al-Awsat is another step in a longstanding Saudi-Israeli campaign aimed at undermining the Iranian-Russian cooperation over the Syrian conflict. Israel and Saudi media have released multiple reports and speculations alleging that the Iranian-Russian alliance is shrinking or is about to collapse. Contrary to these allegations, in reality the both countries have been successfully cooperating en rotue to reach their joint goals: to defeat radical groups, to strengthen the central government and to set a foothold for restoring a territorial integrity of Syria. 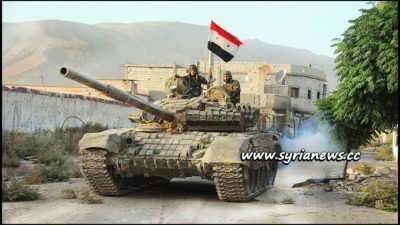 The recent series of propaganda claims and Israeli strikes are likely linked to the ongoing preparations of the Syrian Army to launch a military operation to regain the southern part of the country from militants.